An installation of 600 paper planes, made from the pages of a book – LIVERPOOL Gateway of Empire, by Tony Lane, and maps of the Wirral, Liverpool, Leeds and Stockholm. At first glance, this is probably an usual book to choose for an installation of planes, after all it is a book about the everyday life experiences of ship owners and seafarers, not air travel. I felt though that it was about working together on a project that is heavily dependent on funding and collaboration. I had recently returned from exhibiting in SUPERMARKET: the Stockholm art fair ( with the group SciBase) http://www.supermarketartfair.com/ a year long project, funded by Arts Council England, which saw a collaboration between UK and International artists, initially exhibiting in Liverpool, Leeds and Stockholm. The project inevitably involved a lot of travelling and communication and when I picked up the book – which was gathering dust on my bookshelf, I began to see connections. 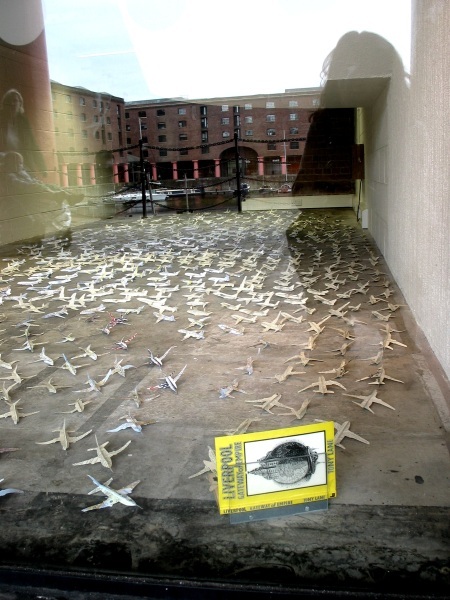 The planes filled the unit, in Liverpool’s Albert Dock, As part of Liverpool Independents Biennial.